sorry for neglecting this page of late, wayy too many things happening around home with the kids and not quite enough hours in the day! We are still here workiing away. Currently i'm working on some long sleeved applique tops and overalls are also in progress..... will post some more pics shortly! the "sew" you say handmade markets ABC Showcase started yesterday at 8pm and continues through until tomorrow night (21st Feb) at 10pm. 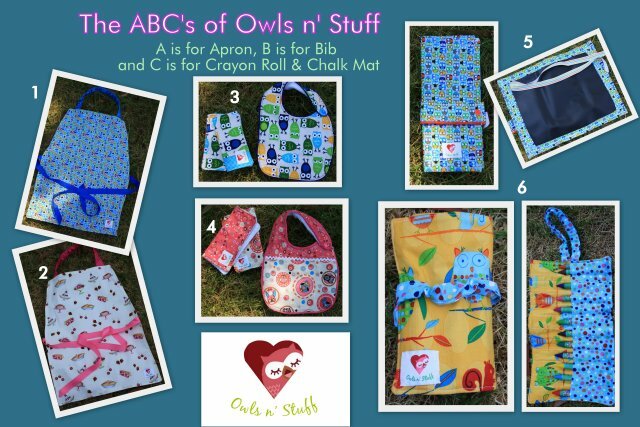 Owls n' Stuff have launched two new products in this showcase - being A is for Apron and C is for Crayon Roll. Both of these items can be custom made with plenty of fabric options available. With Easter not being far away, out Easter range will start appearing shortly. just a little note to let you know of an upcoming showcase that we are participating in. 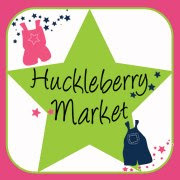 Its the 'Sew' You Say Handmade Markets ABC themed Showcase and Starts on 19th February. We are releasing two brand new products on the night with a couple available ready for shipping and custom orders welcomed! Please pop by on Tuesday night and support Handmade. 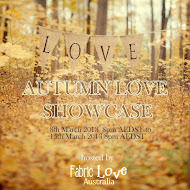 We are also participating in the upcoming Autumn Love Showcase over at Fabric Love Australia which kicks off on 8th March. 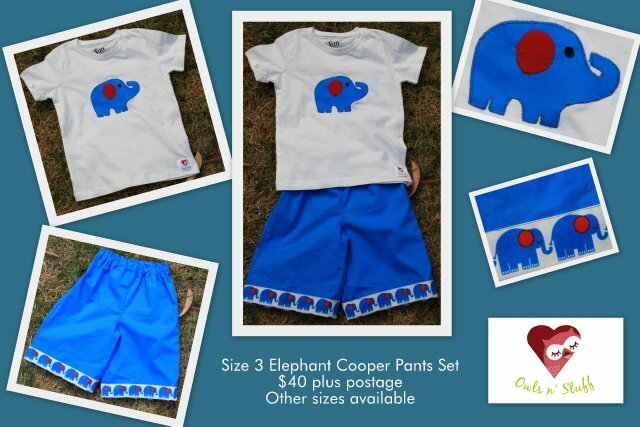 It is now safe to say that I am finally getting back in the swing of things and earlier this week I released this Size 3 Elephant set to those of you on Facebook.... I will upload to Etsy shortly if there is no takers from Facebook. I can also complete a custom order of this set in a different size, please contact me for further information. I will also be releasing some Easter items shortly so stay tuned! For now! Thanks for all your support! Just a quick note to let you all know that I have listed some new items on Etsy... please check them out!! just popping by to wish you all a Happy and Safe Australia day! !